Get to bed at a decent hour. Since that was a lot of ground to cover in a short time I decide to consolidate. With Chris’ help I covered dog license, 3.5 mile run, and swinging by my parents house. Of course, the run was the only successful part of that equation. Chris and I drove to the Village Hall to get the dog license, but when we got there we found out the shelter didn’t give us the proper proof of rabies vaccination to get the license. This wouldn’t be a problem except the Village Hall is only open Moonday through Friday from 8 – 5 except on the 2nd & 4th Tuesday of the month when they’re open til 8pm. It just so happens that from the Village Hall to my parent’s is 2.7 miles. From my parent’s house to my house is just over 1.25 miles. Together that gave me 4 miles which was perfect for warm-up, 3.5 mile run, and cool-down. I knocked off three of my to-do’s in just about an hour and gave a whole new meaning to running errands. My calorie burn for the run was about 750. MapMyRun.com – Regular Run: iMapMyRun: May 11, 2010 7:31 PM on 05/11/2010. I didn’t end up getting the tools (long story, for another time) so I don’t have to tear out the carpet. Once I got home I started dinner. Dinner is a Very Veggie Crustless Quiche but more on that in a minute. While the quiche was baking Chris and I took Maxwell on a nice mile walk. I was able to burn another 160 on the walk. Now we’re going to eat some dinner and watch Glee. Afterward I’ll shower and get to bed at a decent hour. Dinner tonight was a quiche I threw together. It had bacon, Swiss cheese, broccoli, asparagus, spinach, artichoke hearts, and onions. It was pretty good and is definitely getting filed under “make again.” I need to work on seasoning though. I’m afraid to over-season, and because of that I usually under-season food. 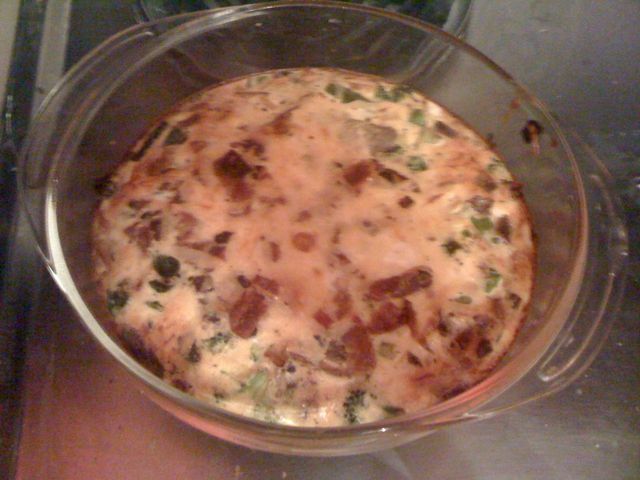 The best part, a quarter of the quiche clocks in under 200 calories. Dessert was a half cup of applesauce with cinnamon. Delish!